In 2009, as its endowment plunged by nearly 30%, Harvard University halted construction on a $1.2 billion science center across the Charles River, angering the neighborhood there by leaving behind a foundation and an idle construction site. Harvard now says it will resume work on the project, but not until 2014 and even then at half the originally planned size, reflecting a newfound fiscal caution at the school. "The economic realities necessitate this," Kevin Casey, a Harvard spokesman, said in June at a community meeting. "There was a definite change in mentality over there...there was a sort of sky-is-the-limit attitude but now they are taking much more cautious approach," says Gerald Autler, a senior project manager for the Boston Redevelopment Authority, a public agency which works with colleges on building projects and expansion. Harvard isn't belt-tightening everywhere. Since 2007, its investment in financial aid to undergraduates has risen by more than 78%, which Harvard said is "significantly outpacing increases in tuition." Undergraduate tuition for the 2012-13 year climbed 3.5% to $54,496. In May, Harvard committed $30 million to edX, a collaboration with Massachusetts Institute of Technology to provide online classes to the public. Globe - Daly Field bill "is a poor example of privatization"
"Daly Field is currently operated by the state Department of Conservation and Recreation, which has neglected it amid uncertain funding. But that’s no reason to write it off. Daly Field is still a valuable state asset with great potential. Under no circumstances should hours of use be dominated by a private college. And hours devoted to public use, for that matter, shouldn’t be monopolized by residents of a single neighborhood. State environmental groups, including the Conservation Law Foundation and the Environmental League of Massachusetts, have urged lawmakers to reject the bill, but were ignored by the House and Senate. Governor Patrick shouldn’t make the same mistake." When would "regular" people get to use the new semi-private Daly Field? Simmons will have full use of the field from 5:30 to 9:30 p.m. on weekdays from March to May and mid-August to November. The Brighton High football team would have practices from 2:30 to 5:30 p.m. weekdays and Friday nights from mid-August to November. The bill also carves out time for the Allston-Brighton Little League on weekday evenings from May to July. Saturdays would be time-reserved and shared by Simmons College, Allston-Brighton, and abutting communities. Sundays would be reserved for Allston-Brighton and abutting communities. Why have outdoor public space in Barry's Corner? We had some discussion about outdoor public space in Barry's Corner at last night's Harvard meeting. There was talk about both where it should be (along North Harvard St, along Western Ave, at the intersection, etc) and its shape (thin and linear vs. compact) but I think the conversation should start with what types of activity the space is intended to host. What are its goals? Sitting and eating was mentioned frequently and that is fine, but if Barry's Corner is going to be a real center of community activity then it needs to bring people together to do more than have a sandwich on a bench. 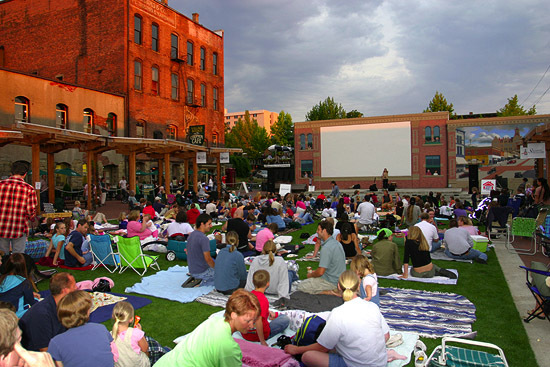 The Fairhaven Outdoor Cinema in Bellingham, WA is one example of a great looking outdoor space that brings neighbors together. On summer Saturday evenings there is live music starting at 7:30 or 8:00 followed by a family-friendly movie. There are already other places around Boston with similar events (Free Friday Flicks at the Hatch Shell and Music & Movie Fridays at the Boston Harbor Hotel) but I don't know of anything comparable in this area. A space with programming like this would be a great addition to our neighborhood and could be a nice place for the Harvard community, Allston residents from our existing community, and our new neighbors from the new Barry's Corner housing to all come together. "Get your last photo ops of Beacon Park in action. Domestic freight transloading moves to Worcester officially on Sept. 1."